Recorded in many spellings including Horsburgh, Horsborough, Horsbrough, Horsbra, and no doubt others, this is an ancient surname of Scottish origins. 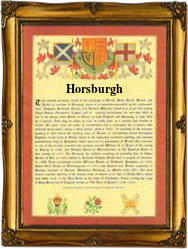 It is locational from the ancient castle and lands of Horsburgh, near Pebbles, in the parish of Innerleithen. It is said that the first holders of the lands were Anglo-Saxons, and the first land owner was probably called Horse. They, it is claimed settled there in about the year 850 a.d. However the first known recording of the surname is believed to be that of Simon de Horsbroc, who witnessed a charter to the monks of Melrose Abbey in the year 1230. William de Horsebroch is then recorded about half a century later, and he is given as being a cleric or clerk working on behalf of the diocese of Glasgow in 1283. He was also apparently a Notary Public, which would account for his prowess with the pen. In 1297 a Simon de Horsbrok who held the lands of Horsburgh seems to have entered into some agreement to support King Edward 1st of England, and had his lands confiscated. However this may have been a case of mistaken identity, because almost immediately they were restored to him. It would seem that the castle and lands were in ruin by the 17th century, which may account for the dispertion of the modern surname.